First, Blizzard has released a Warcraft III patch v1.21b which allows you to run the installed game without the Warcraft CD. Secondly, possibly the most popular game using the Warcraft III engine, DoTA AllStars (my friends haven’t played regular Warcraft III LAN games since we discovered since discovering DoTA Allstars) has a new AI version (i.e so you can play with/against bots) : 6.48b AI+ v1.52 (login required). Sumatra PDF 0.8 slim, portable, open-source PDF viewer for Windows. GIMP 2.4.3 bitmap editor suitable for photo retouching, image composition and image authoring. ClamWin Free AntiVirus 0.92 ClamWin is a Free Antivirus for Microsoft Windows 98/Me/2000/XP/2003/Vista. wxMusik 0.4.2.2 An open-source, cross-platform multimedia player and library. Been working on a DVD version of TTCS OSSWIN, but too much activities occupying my time now. New version of Kobo Deluxe available! When Mozilla Firefox v2.0.0.9 was released on November 1st, 2007, starting preparing the TTCS OSSWIN CD. Hmm….a few more updates since I last checked the TTCS OSSWIN CD for updates…. : Gimp v2.4.1, Scorched Earth, Freeciv….. ….then I see a version 0.41 of Kobo Deluxe is available! 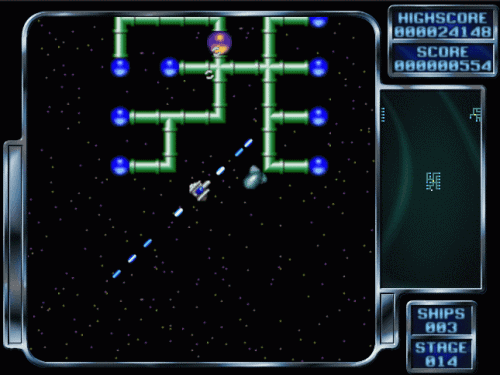 A description for the uninitiated : Kobo Deluxe is a third person scrolling 2D shooter with a simple and responsive control system – which you’ll need to tackle the tons of enemy ships that shoot at you, chase you, circle around you shooting, or even launch other ships at you, while you’re trying to destroy the labyrinth shaped bases. There are 50 action packed levels with smoothly increasing difficulty, and different combinations of enemies that require different tactics to be dealt with successfully. Kobo Deluxe is loads of fun, classical arcade style (and addictive!) gameplay! I’ve already created a Windows installer for the TTCS OSSWIN CD. According to this Reuters report, Sony has sold 1.01 million units of the PS3 as of July 15 while Wii sales totaled 2.9 million units as of July 8 and sales of Microsoft Corp.’s Xbox 360 have came to 420,705 units in Japan. Ars Technica has a breakdown of console sales in the US and Japan.